Very good anthology. Only a few that were forgettable or not likable at all. This one had a few more eerier tales than Catopolis (perhaps Norton's influence) and I've already got myself on the wait list for Catfantastic II and I think there are about four or five in this area. 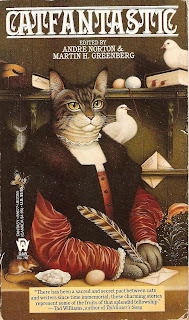 "The Gate of the Kittens" by Wilane Schneider Belden - A librarian happens upon Feathers who was the intended sacrifice for this gate between worlds, but three kittens allow for safe passage and sabotaging something sinister out there. This was a little bitter sweet, but I'm sure the librarian will have a good life, it's still sad about the kittens and the bus. "The Damcat" by Clare Bell - There's more than one way to ensure the structure of a dam. Pretty interesting story about Native American healing helping secure a dam. "Borrowing Trouble" by Elizabeth H. Boyer - Trouble lands in the lap of a wayward apprentice. This one was cute. "Day of Discovery" by Blaka Cahoon - A doctor's accident/murder, pushes his former lover to test the edge of science and finds out cats are aliens. This isn't saying anything new, is it? "Wart" by Jayge Carr - Wart is a space ship cat who comes across an intruder and deals with it as any cat would. Told from Wart's point of view and I like how the author got the cat's POV. "Yellow Eyes" by Marylois Dunn - A cat runs across Yellow Eyes, a unique hound, who helps a cat and his friend find the solution to a unique problem. Sorcerers and cats, a perfect fit. "It Must Be Some Place" by Donna Farley - How to find things in the land of the lost. Perhaps my least favorite because all the references to lost things, Time and Socks, it just became too much after a while. "The Dreaming Kind" by C. S. Friedman - Trouble is brewing as a super computer tries to find the origins of the world and only an genetically altered cat and kitten are able to stop it. This one was a little eerie and scary. "Trouble" by P. M. Griffin - Trouble and his kitten (girl) land out of trouble. Cute tale. "SKitty" by Merecedes Lackey - SKitty makes a grand entrance to the negotiation table. SKitty's adorable -- I want one! "The Game of Cat and Rabbit" by Patricia Shaw Mathews - The ship cat finds a mutant rabbit aboard the ship. This one was a little odd, but pretty decent. "From the Diary of Hermoine" by Ardath Mayhar (I think the inspiration for the cover) - Hermoine finds out she taught her kittens how to hunt a little too well and that the magician she's with wasn't too swift. I liked the tale told from the mother and how her children teach her a lesson. "It's a Bird, It's a Plane, It's … SUPERCAT!" by Ann Miller and Karen Elizabeth Rigley - Clark Kent and his owner help an alien retrieve a missing bird. Cute story with aliens, tension, and romance. "Noble Warrior" by Andre Norton - Noble Warrior saves his new princess from the evil governess with the help of Hob. I've heard how Siamese and their derivatives are often protectors of their home and I thought this interesting of how a cat might view his position and protect his assigned mistress. "Bastet's Blessing" by Elizabeth Ann Scarborough - A cat travels to Egypt to keep his human safe. A little odd, but otherwise amusing. Andre Norton and Martin H. Greenberg. that's a great pairing. no wonder this was a good anthology. Norton rocks. Thanks for mentioning my story "The Damcat" in your review of Catfantastic. My tale was based on a plaque to the memory of a cable-pulling cat that actually exists at Hoover Dam (Black Canyon Dam in the story). I have other stories in the Catfantastic volumes, and I hope you enjoy those. "The Damcat" was pretty good, full of suspense; I cringed as I read it. I'll have to check out your other cat books and look forward to reading the your Catfantastic storie. hamilcar - I've heard plenty of good things about Andre Norton. I wonder if she was the reason for the eerie and sci-fi tales. Since there are five in the Catfantastic and some of the same authors, I wonder if it will follow the same format. I do hope so.